Let’s face it: Estate planning is, for most people, challenging at best. It involves grappling with mortality, trying to remember arcane terms and concepts, and — perhaps most challenging — addressing sensitive family issues. It’s a small wonder that so few people have an up-to-date estate plan. One of the reasons the process is so challenging is that most people view estate planning in isolation. That is, they think of it as involving things that happen only after they’ve died. Viewed more comprehensively, however, estate planning is really just one component of a properly structured financial plan. And good planning goes beyond finances. To create a plan that may truly improve your life, you must first discover those key goals and issues that really motivate you, and then compare your existing financial situation to these goals to see how prepared you are to meet them. Once you’ve uncovered what is most important to you, you can begin to formulate a plan that really makes sense. 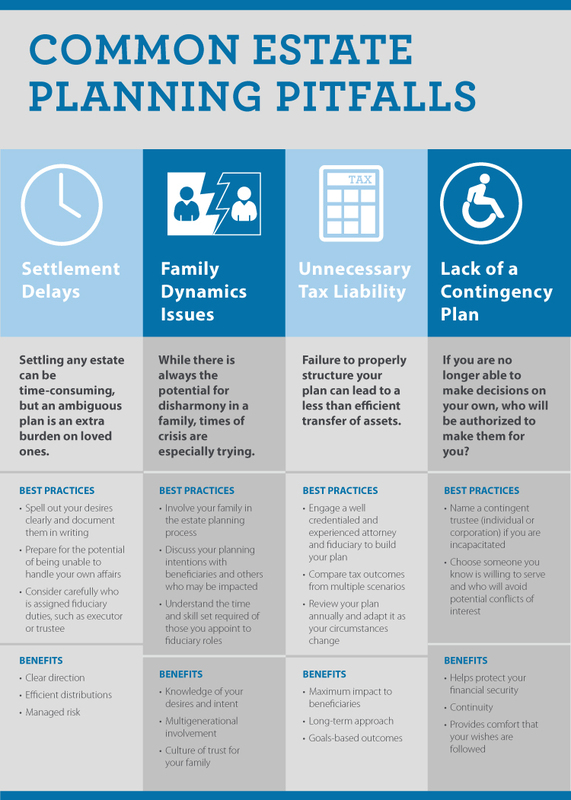 Why have an estate plan? The reasons begin with providing for a spouse or children or other family members and aligning your wealth transfer with your charitable vision. But there are other things to consider, such as helping protect assets from lawsuits or creditors, avoiding probate, or avoiding a substantial settlement impact on your heirs. See the chart below for other pitfalls to consider. The way you own your wealth can have a huge impact on whether that wealth will actually pass according to plan. In other words, the way in which assets are “titled” can either support or undermine your estate plan. Most people may talk to their estate planning attorney only once every five or 10 years. Even if assets are properly titled at the time the estate plan is completed, assets acquired after that will need to be reviewed to ensure that they are owned in the proper form and included in the plan. And these newer assets are generally the ones that may cause an unintended or inefficient transfer. Even experienced estate planning lawyers will have their share of stories about assets passing to the wrong people. You may have invested a great deal of emotional energy (not to mention legal fees) in establishing a plan that truly reflects the values that you want to pass along with your wealth. Don’t let that work go by the wayside because of titling problems or other pitfalls. Chapter Two: What Goals Do I Have?